Even fluent French speakers sometimes have trouble understanding the dialogue in French films, so the new service offered by an association called Lost in Frenchlation, which subtitles French films in English, is a welcome one. 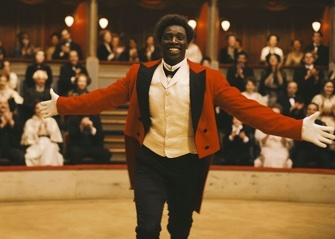 The goal is “to make French cinema more accessible to the international community in Paris.” The next event will be a screening of Chocolat, a recent movie starring the charismatic Omar Sy as the first black stage performer in France and James Thiérrée (Charlie Chaplin’s grandson) as his stage partner, on Friday, 18 March, at Studio 28 (10 rue Tholozé, 75018 Paris). Admission is €5 (cash), which includes a movie-themed cocktail (8pm) before the screening (9:15pm).